Neurolink Occupational Therapy (OT) provides a specialist assessment and neurorehabilitation service to adults who have had a brain or spinal injury after illness or accident. We work in partnership with our clients, their family, support workers and other involved professionals to maximise the potential of our clients. We approach the challenges of neurorehabilitation with an open mind and an enthusiastic, creative attitude. Our ‘can do’ attitude means that we work on areas of priority for our clients, because our clients are the priority for us. We understand that life is about taking risks and work to ensure that, where safe and appropriate, we support clients to achieve their goals. Our therapists are experts in assessing the physical challenges experienced by our clients; how their body has been affected and how their environment impacts them. 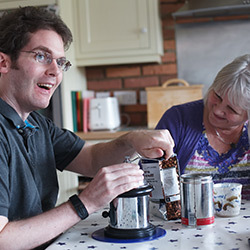 We recommend techniques or strategies, to promote independence and manage fatigue, suggest changes within the environment and prescribe equipment to maximise independence, thereby reducing our clients dependence on others in everyday tasks.